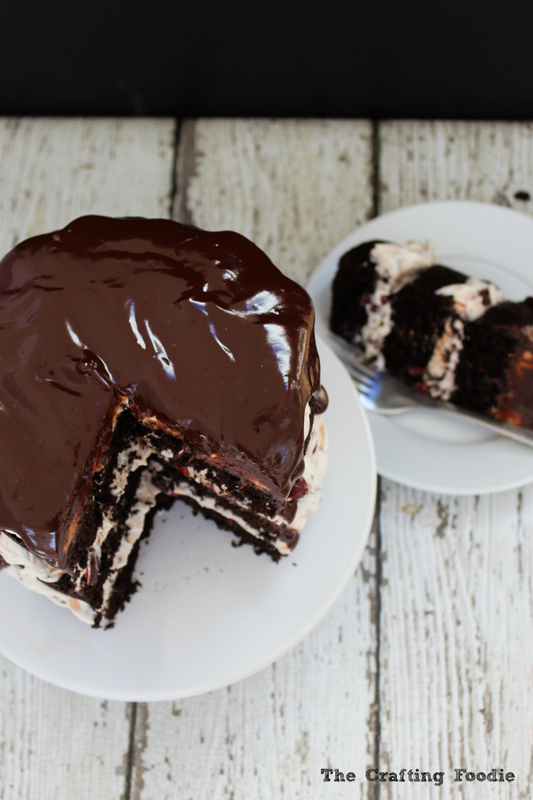 This three-layer, Chocolate Cherry Cake is moist, intensely chocolate cake filled with fluffy cherry, dark chocolate frosting, and drizzled with dark chocolate ganache. Last weekend when we celebrated Father’s Day, I wanted to make a dessert for my husband – the thoughtful, loving father to our two extremely creative, active, and thoroughly amazing daughters. A cake for him. Not for the kids. Not for me, but for him. That would make sense, right? It was Father’s Day after all. So when I asked my girls what we should make, my six-year old came up with a genius idea. She said, let’s make him a Cherry Garcia Cake. If you’re not familiar with Cherry Garcia, it’s a Ben and Jerry’s ice cream flavor. It’s named after the iconic Jerry Garcia (the lead singer for the Grateful Dead). While my husband isn’t ,and has never been, a Dead Head (that’s what you call Grateful Dead fans), he is a rabid consumer of the Ben and Jerry’s ice cream flavor. It’s a vanilla ice cream filled with chunks of chopped cherries and chocolate chunks. It’s my husband’s favorite. 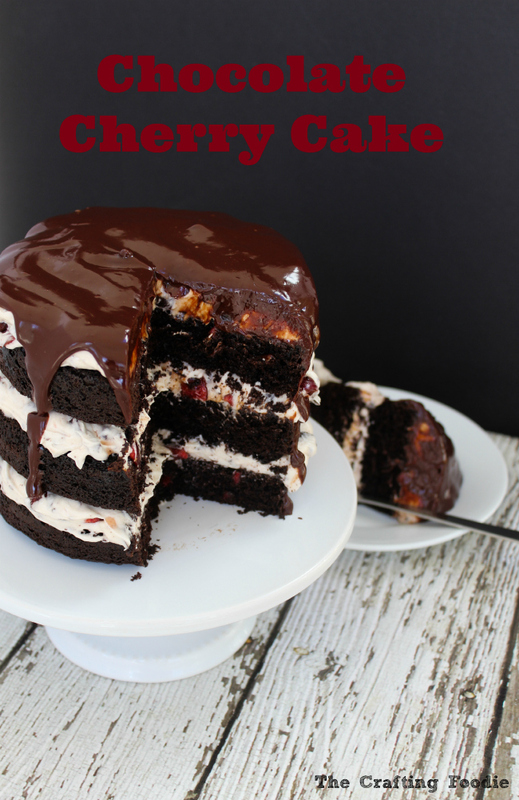 And this Chocolate Cherry Cake is our ode to his favorite ice cream flavor. I have to be honest with you. This cake isn’t for the fainthearted. The cake layers may look pretty plain, but they pack a chocolatey punch. They’re a dark, rich chocolate. And the filling – it’s full of large, juicy pieces of fresh strawberry and chunks of chopped dark chocolate. Because chocolate sauce is one of our favorite ice cream toppings, my girls and I thought it would be a very ice-cream-like touch to top the cake with a chocolate sauce. We chose a dark chocolate ganache as the topping. 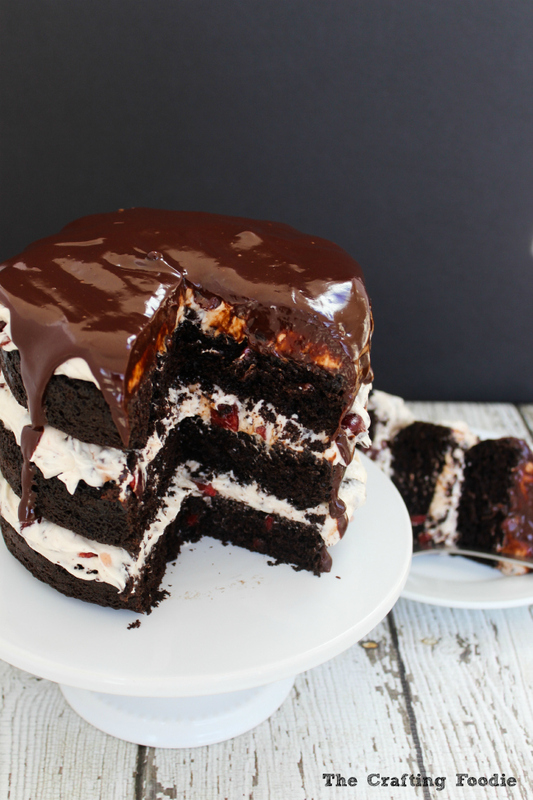 Even though this Chocolate Cherry Cake is a show stopper in its own right, it definitely wasn’t the star of Father’s Day. 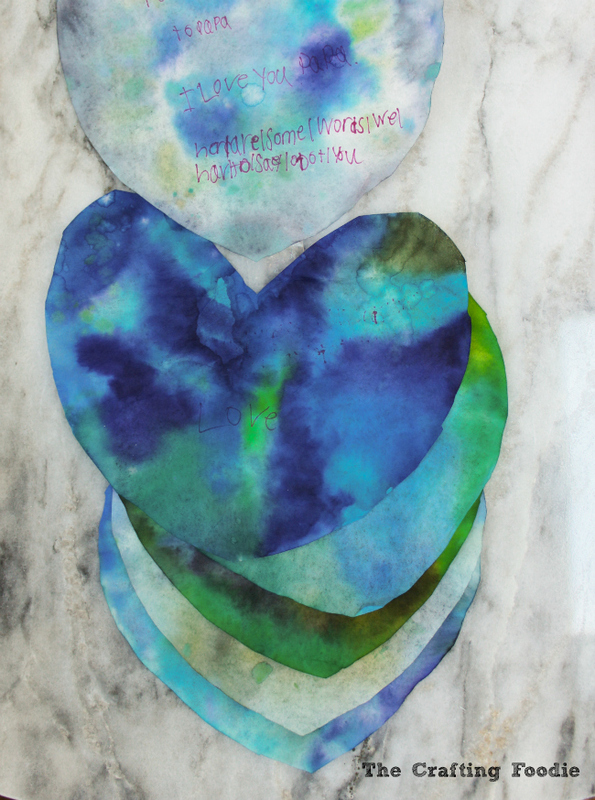 My girls created a series of coffee filter hearts decorated in their dad’s favorite colors (blue and green), and on each heart they wrote why they love him. It was totally their idea. Working together they did everything themselves, and I know that it’ll be a gift that my husband cherishes forever. The hearts say: To Papa. I love you papa. Here are some words we have to say to describe you. Love. Kind. Fun. Cheerful. Nice. Line 3, 6-inch circular pans with parchment paper and grease. In a small measuring cup, mix the milk and vinegar. Allow it to sit and curdle. In a small bowl, mix the flour, cocoa, baking soda, and salt. In the bowl of a mixer fitted with a paddle attachment, mix the sugar, oil, egg, and vanilla. Mix the flour and milk mixture into the batter in three, alternating additions, starting and ending with the flour mixture. Bake for about 22 minutes (anywhere from 22 to 27 minutes) or until the cakes spring back when lightly pushed in the center. Allow the cakes to cool in their pans on a baking rack for about 15 minutes. Turn cakes out on to cooling racks and allow to cool completely. While the cakes cool, make the frosting and ganache. In a bowl of a standing mixer fitted with a paddle attachment, beat the butter until light and fluffy. Add the powdered sugar. Beat until fluffy. Add the vanilla. Mix until incorporated. 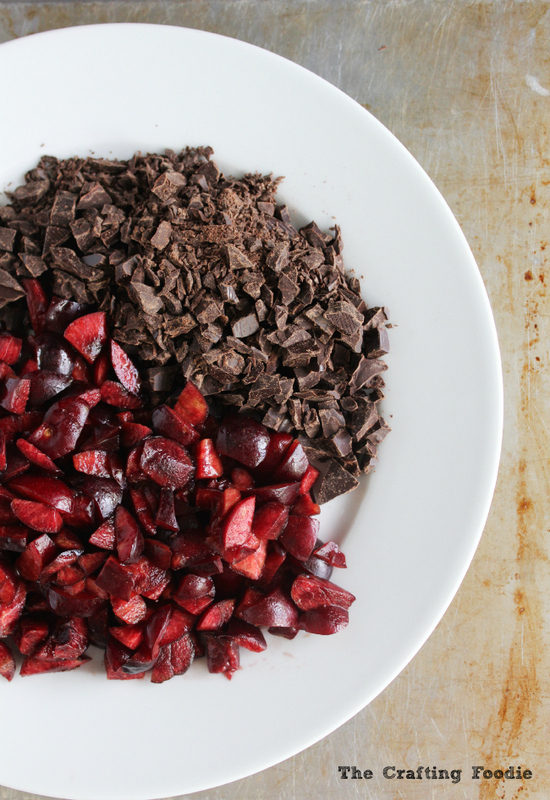 Using a rubber spatula, mix the cherries and chopped chocolate. Warm the cream until scalding. Pour the cream over the chopped chocolate. Cover with an air-tight lid. Allow to stand, undisturbed for 5 minutes. Stir until smooth and shiny. 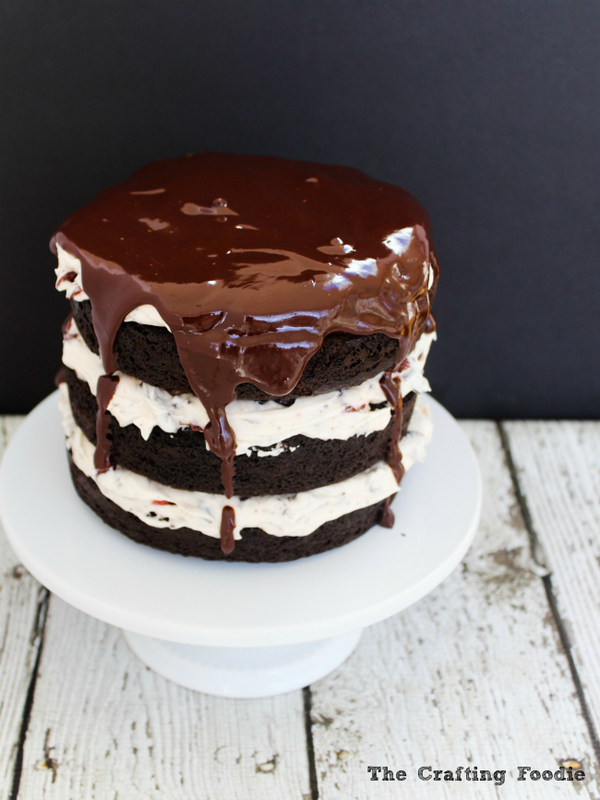 Stack the cake, placing chocolate cherry frosting between each layer. Place frosting on the top of the cake. Chill for about 10 minutes in the fridge. Pour the chocolate ganache over the top of the cake. I just love chocolate and cherry together! This looks delicious! Pinned for my next special occasion. Aida, this is such a beautiful and decadent cake. Drooling here. All it needs is a big scoop of my Ben & Jerry’s Cherry Garcia ice cream. (On the blog last week.) 🙂 Happy 4th to you and your sweet family! Yum, the first thing I thought was Bailey’s chocolate cherry! I’m bookmarking this for whenever I purchase some fresh cherries. I hope you do give it a try Linda. It was absolutely delicious!